Objective: Set fields of the customer questionnaire and learn how to use them for work on customer segmentation. Customer questionnaire will allow you better target (segment) customers for marketing activities. Fields of customer questionnaire customer fills at the time of registration in loyalty program in the inCust mobile app, in personal account on the website or directly at the point of sale in way of dictating personal information to the salesperson. Name, gender and date of birth are automatically included in the questionnaire of all partners. If to you come the customer, who has previously registered in another inCust partner, most likely that this information will be in the questionnaire. Other fields that you specify are visible only within your business and never shared with anyone of the partners. String – is the ability to enter a word (for example, Petrovich). Date – is created to mark important dates, which you collect by customers. (Do not duplicate date of birth, it is set as default in profile). Number – is used for entering numbers (for example, age, number of family members and others). Click Dictionary, if you need to make the drop-down menu consisting of several words to choose from. Now these fields will integrate into the customer’s profile. When providing customer services with the help of the inCust Register Online App you can determine whether to show on-screen the customer profile or to keep it ‘rolled’. For some businesses it is comfortable to see information on customers at once, for some only when they register new customer. By default the last one is configured when salesperson is requested to fill in customer profile only at the first visit. Display only for new customers– questionnaire appears only once, when the customer is registered in the loyalty program. Do not display – profile does not appear automatically. But you can always call it in manual mode. To take look at the customer profile in the Register at the time of the transaction the salesperson must click in the upper right corner and the customer profile will be displayed on the screen. Display for all customers – profile appears on every transaction after the customer identification. To view the customer profile in the Control Panel click the Customers tab in the left menu, then on line of interesting customer click on the phone number or on the Details button. You will see the window with full information about the customer. 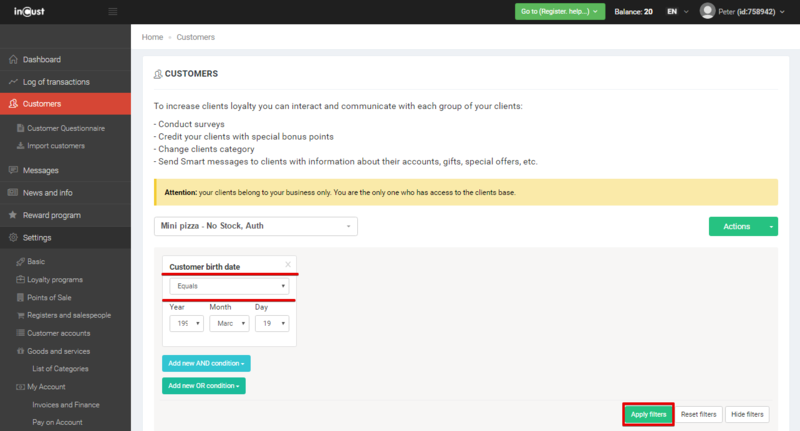 To configure the filters and select from the entire database group of customers with common personal data you must go to the Customers tab in the left menu. You can see whole database of customers. Click Show Advanced Filters and then click Add new condition. On the Main user fields tab select Customer birth date. Then select Equals and enter the date. Click ‘Apply filters’. Now in front of you there is a sample of customers with the same date of birth, which allows in a few clicks to send a congratulatory message to customers or to credit promotional bonus points. Now, let’s select customers from 18 to 25 years. Click on the ‘Show Advanced Filters’ and then click ‘Add a new condition’. On the Main user fields select the Customer birth date. Then set the condition Greater than and enter year (1991). Click Add new AND condition, in the Main user fields select the Customer birth date. Then set the condition Less than and enter the year (1998). Click Apply filters. Use these examples for the samples according to the requirements of marketing activities aimed at different segments of customers.